Want to Put Money Into Doug Ducey’s Pocket? You Can. Back the wrong candidate in last month’s Republican gubernatorial primary? Not a problem. Doug Ducey has a way that you can make amends. The Republican nominee is inviting you to tuck a few thousand bucks into his pocket. It’ll cost you a minimum of $500 per person to attend the 90-minute soiree, though the invitation suggests a donation of $2,000 toward the fall campaign. But it also notes that you can offer up $4,000 per person if you haven’t previously contributed to his campaign. 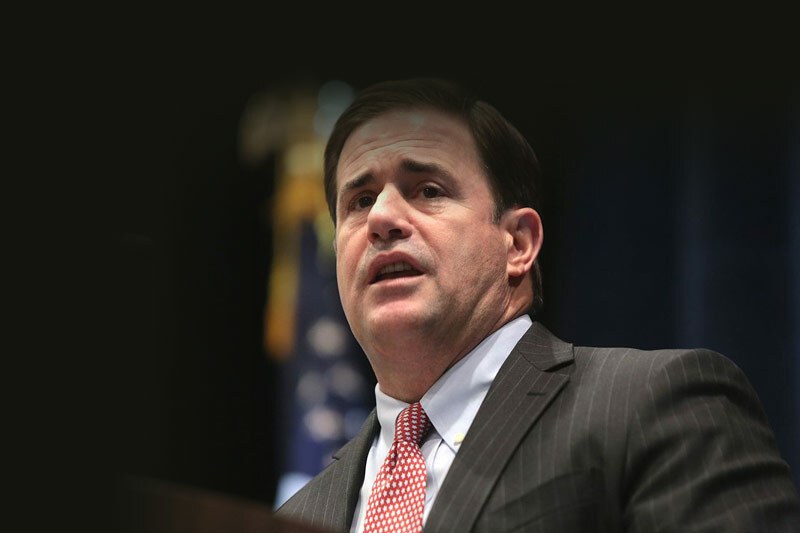 “Unless specified otherwise by the donor, Ducey 2014 will allocate the first $2,000 of a contribution to the general election and any additional contribution to primary debt retirement,” the invitation says. So who, might you ask, does the Ducey campaign owe? According to campaign-finance reports, more than $3 million of the $4.3 million spent in Ducey’s primary campaign was money that Ducey loaned his campaign. Now he’s hoping to get some of that $3 million back – from people who I suspect might be quite happy to put money into the pocket of the man who may be our next governor. It’s all perfectly legal – a perfectly ridiculous law that seems to invite mischief. If you want to self-fund your campaign to the tune of $3 million to get yourself elected governor, you certainly can. But you shouldn’t be asking lobbyists and special interests to replenish your personal bank account if you happen to win. It just looks — and smells — slightly stinky. Ducey spokeswoman Melissa DeLaney says nothing nefarious is afoot. The campaign’s priority, she says, is to raise funds for his general-election run but if people want to help retire campaign debt, they can. DeLaney didn’t disclose how much vendor debt exists. She says Ducey loaned his campaign funds knowing he might not ever be repaid — as in 2010, when he loaned $600,000 to his campaign for state treasurer and never recovered a cent of it. But knowing also, I’d bet, that if elected he’d have four years to host fundraisers in order to get his money back. I’m told that it’s not all that unusual for candidates to loan their campaigns money then seek repayment if they win. However, the only Arizona candidate DeLaney and Ducey attorney Mike Liburdi could point to is Democratic Rep. Ann Kirkpatrick. According to FEC records, Kirkpatrick loaned her campaign $20,000 and was repaid $12,500 in 2008. Lobbyists often hold post-election fundraisers to pay off legislators’ campaign debt. It’s hard to nail down whether those contributions are made to cover outstanding bills or to boost the winners’ bank accounts. Democrat Fred DuVal, who had a free ride in the gubernatorial primary, hasn’t made any loans to his campaign, though he and his wife have contributed $53,000. Campaign Manager Bill Scheel says DuVal has no plans to seek reimbursement for any funds he kicks into the campaign. Scheel says that DuVal is no longer accepting money for his primary campaign because he has no debts. Republican consultant Stan Barnes agrees that what Ducey is doing is common, though he couldn’t name a single candidate for governor who’s done it. Barnes, who backed Scott Smith in the primary, says he plans to contribute $2,000 to Ducey’s general-election bid but won’t be kicking in anything extra. “It wouldn’t even occur to me to give him extra money so that he could pay off his debt,” he said. But I would bet it’ll occur to plenty of others — lobbyists and folks needing a favor. Then again, I suppose there are worse things than a candidate for governor soliciting money to go directly into his pocket. Like maybe a governor soliciting money to go directly into his pocket. Reprinted from The Republic. Article by Laurie Roberts, Columnist, The Republic | azcentral.com. Read the original story here.